During Maker Faire 2015 Inventables hosted a party Saturday night at Windy City Pizza. We come visit the Bay Area from Chicago so we couldn't think of a better place to host a party! It was close to Maker Faire and had some delicious pizza. We invited everyone to come sit down, rest their legs, and have some great conversation with other folks in the community. We were honored to have a number of special guests come out and join us for all the fun! We'll get to that in a bit. 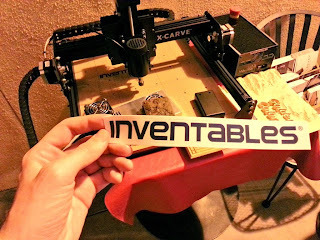 When folks walked up to the restaurant we hung the Inventables banner next to the Chicago Bears sign. The place really had their priorities in order. 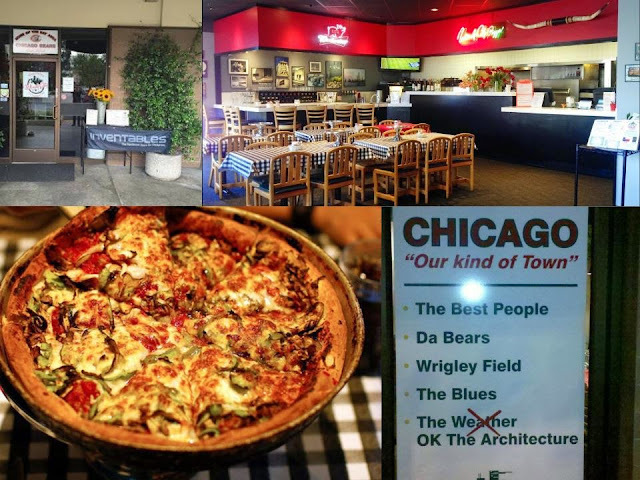 They knew that Chicagoans are the best people, to root for Da Bears, and that Wrigley Field is the best place to watch a ballgame. Some people went right for the pizza but others went right for the X-Carve. We fielded a ton of questions about the machine. Everything from can it carve aluminum to do you have an upgrade path? The answers to both of those questions was yes. We weren't able to run the machine in the restaurant for obvious reasons but the day before we did publish the video below showing the X-Carve milling through aluminum very precisely. We also got a few questions about how the new spindle compares to the rotary tool we used to ship with. There are a couple of differences we pointed out. The first is that the old rotary tool was a 120W with an AC plug. The new one is a 300W 24V DC spindle. Since it is DC it can be controlled by Easel and uses the same power supply as the stepper motors. The increased watts translate to increased torque. Torque is the measure of how much immediate rotational force a spindle drive motor can generate. Torque is important when you want to maximize your speeds and feeds. Speeds and feeds translate into how fast the machine can carve out your part. There was quite a bit of excitement around the new X-Controller below. We had our prototype on hand so people could take a look at the form factor and learn about the features. There was quite a bit of interest in the fact that it has 4 stepper drivers that are each 4amps. We also heard positive feedback on the new connector system that really cleans up the wiring. Towards the end of the night we started getting people testing out the E-Stop button which is the red button that sticks out of the top. We had experimented with putting the E-Stop button on the front but our pizza parlor testing clearly demonstrated that putting it on the top was the right choice. One of the coolest parts of having a party during MakerFaire is all the Makers that you get to hang out with. We had a couple celebrity YouTube makers on hand including Jimmy Diresta who has , Bob from I Like to Make Stuff and David the Drunken Woodworker. It was pretty exciting to have a drink with the Drunken Woodworker. Nobody got drunk but he did teach us a little bit about beer and a little bit about woodworking! Wish I could have made it. Found out to late.